Schylling's line of Panda's Picks Eco-Friendly Games are made from bamboo the ultimate sustainable 100% biodegradable material. This is an attractive little version of the ancient game of Mancala. The object of Mancala is to accumulate the most pieces through a series of moves and captures. Two players sit facing each other with the board between them. The board consists of two rows of 6 small pits with a large pit at each end called a reservoir or scoring pit. 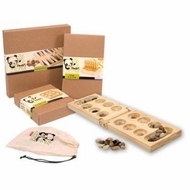 The small pits hold the pieces to be played and the reservoirs hold the captured pieces.This Mancala board folds out to measure about 12 1/2" x 3 3/4" and comes with all natural stones as playing pieces. Please note: Instructions for Mancala are not included but can be easily obtained online or byCLICKING HERE.